Perfect paddling conditions at Middle Caicos. The mangrove wetlands on these two islands are extensive and offer a huge amount to explore. Paddle board rentals options however are limited and distances can be overwhelming so you may want to consider more energy-efficient kayaking instead. You may also be interested in our Paddle Boarding Overview page. Both North Caicos and Middle Caicos have extensive mangrove networks. Paddle boarding (also known as stand up paddle boarding or SUPing) on North and Middle Caicos is a mixed situation. Both islands offer huge and extensive wetlands and mangrove channels (much of which are virtually never visited by people), yet rentals and guided tours are lacking due to the limited tourism. To really get a good paddling experience, it will be necessary to plan a little in advance. It may also be necessary to transport your boards on land by vehicle to the best launch location. 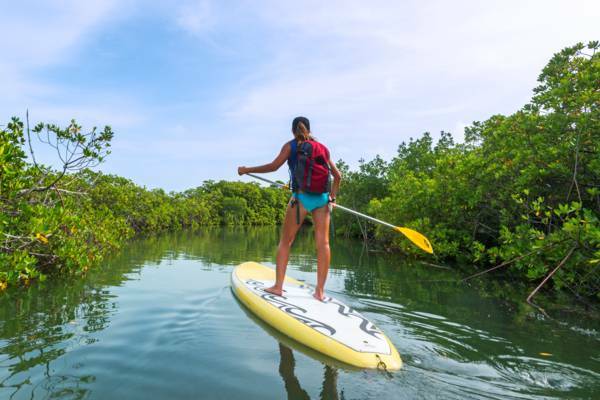 However, we generally recommend that most who want to paddle and explore the wetlands of North and Middle Caicos travel with a guide for ease of SUP transport and navigation. The mangrove wetlands and waterways are the nurseries of the marine environment in the Turks and Caicos. Juvenile lemon sharks (typically only a foot or two long!) turtles, conch and fish area abundant in most channels. Above, herons (tri-coloured, great blue, green-backed, and yellow-crowned night), egrets (reddish, great white, and cattle), pelicans and flamingos can be seen. Polarized sunglasses are great to have when paddling as they significantly cut down on water surface reflections, allowing for a much clearer view of the interesting creatures below. The calm waters off of Horsestable Beach and the Bay Cays. The beautiful Bottle Creek is the most popular paddle sports spot on the two islands, mainly due to ease of access. 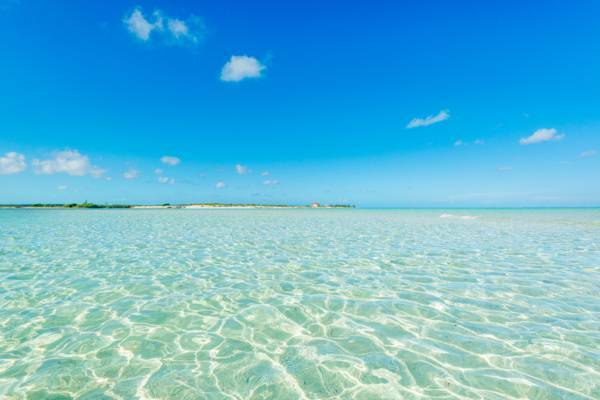 Here, a shallow wide lagoon separates North Caicos from the nature sanctuary of East Bay Islands National Park. Because of the openness of Bottle Creek, surface conditions can get quite choppy and windy. If you make the journey across Bottle Creek to the north coasts of the cays (about 3-4 miles), expect secluded beaches, excellent beach combing and abundant birdlife on the uninhabited Bay Cay and East Bay Cay. The southwest coast of North Caicos offers extensive mangrove networks and is the best spot for boat launching on an excursion from Providenciales. Largely unexplored by kayak or SUP, the sheltered channels are home to juvenile sharks and turtles and the larger open ponds have flocks of flamingos and the larger wading birds. Bellefield Landing is a decent point to launch from for this area. Although remote, Lorimers Creek offers some great areas for exploring. There are two feasible launching spots, Lorimers Landing in the tiny village of Lorimers, and Cedar Point at the end of Wild Cow Run. Possible destinations include the scenic islands of Joe Grant Cay and Dickish Cay. 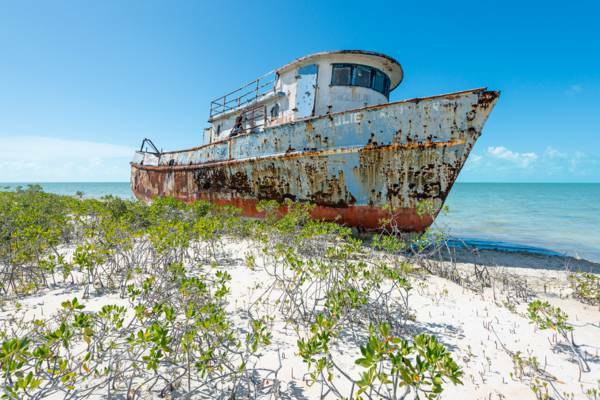 The Erzulie Transport wreck in the mangroves on the south side of North Caicos. Consider the wind. Wind is typically the biggest challenge when paddle boarding as the body acts a sail and it can be difficult to fight your way upwind depending on conditions. Starting your journey by heading into the wind allows your return trip to be much easier. Be aware of currents. 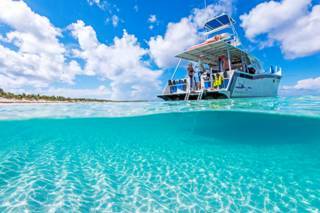 There are countless channels and bottle necks between the cays and small mangrove islands around North and Middle Caicos. During the natural rise and fall of the tides, there can be significant waster movement in these areas. Although these currents really don't pose much of an actual danger, you can avoid unnecessary fatigue by paying attention to your surroundings. Don't get lost. The south sides of North and Middle Caicos have vast areas of maze-like mangrove networks. We recommend that you familiarize yourself to the area by examining maps and also take a suitable GPS unit, or go with a guide knowledgeable about the area. In the past; tourists have gotten lost in these areas on jet skis, with no water or navigation equipment. Big Blue Collective offers stand up paddle board adventures through the extensive North Caicos wetlands for both guests staying on North Caicos and Providenciales.